With your finger on the trigger, you move forward into the unknown. Every step you take is one step closer to the enemy. Are you walking into a trap? Have your teammates got you covered? All of a sudden a paintball fizzes through the air and splatters on the tree next to you. Paintballs start coming from all directions. You manage to take cover behind the giant sphinx. Looking around you see that most of your team are still in play. Do you have the leadership skills to get your team back in a position to be victorious? Players are taking on the Delta Force challenge every day around the country. 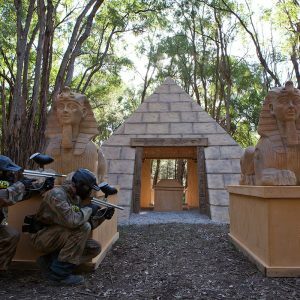 With movie-set game zones and the best equipment in the industry, come and test your skills on our incredible themed scenarios. Not only do we have the best game zones, but we also have state-of-the-art equipment that has improved the safety and comfort of all players. On arrival you will receive all of the essentials necessary for battle, including a full-head helmet, full-length camouflage overalls, custom-designed body armour and a 400-capacity ammunition holder. After undergoing the essential safety brief, you and your team will proceed through to the gun zone where you will be issued with a 0.68 calibre Inferno Paintball machine gun. 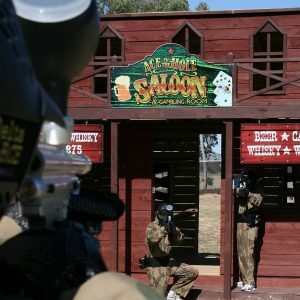 You can also let off a few rounds at our top-secret shooting range, ensuring you get your eye in for the mission ahead. Be sure to take advantage of the natural environment and attack the enemy when they least expect it. The landscape enables you to roam the fields unnoticed and provides you with a range of attacking options. Choose your strategy carefully as one wrong move could mean defeat for you and your team. 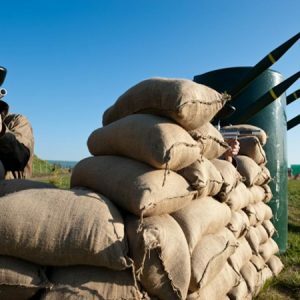 Utilise the trenches and thick bush, along with the incredible movie-set props, to your advantage. From special birthday occasions to youth groups, and corporate events to buck’s/hen’s parties, come and experience all that Delta Force has to offer in terms of amazing game zones, impeccable safety standards and state-of-the-art facilities. Click here for the minimum paintballing age in your state.